If you’re making deviled eggs for New Year’s Eve, serve them in flavors. Fresh dill, curry, infused tobiko roes and wasabi are popular choices. Just divide the mashed yolks mixture after you’ve added the binder (mayo, dijon, sour cream) and salt. But filling the eggs—even just one flavor—can be a devilish chore. Instead of struggling to spoon in the filling, do what caterers do and put it in a Ziploc-type bag. Cut off a corner of the bag and simply squeeze the filling into the egg whites. Now that you know the easy way, here are more favorite flavors to try: bacon (“bacon and eggs”), chopped chives, chutney, crab, crumbled blue cheese, jalapeño, kalamata olives, lemon herb and smoked salmon. See our recipe for these deviled eggs, topped with caviar from The Little Pearl. 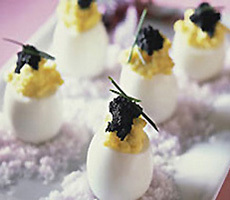 We also have a favorite caviar deviled egg recipe. It has a cap of caviar, but you can also mix tobiko into the filling.